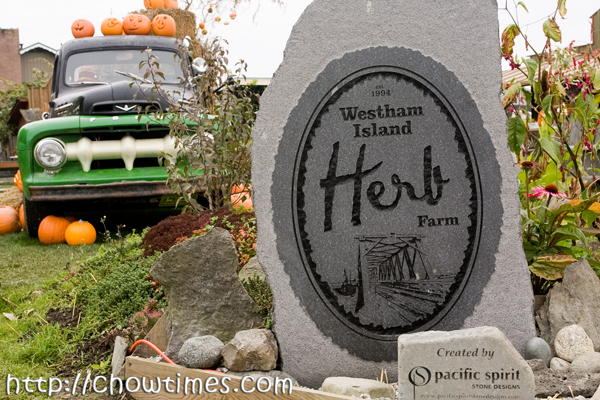 Arzeena organized a field trip to the Westham Island Herb Farm in Delta for the Greenhouse Social Club which is part of the Richmond Fruit Tree program. The tour is to visit the facilities and get a tour of the farm. This farm was established since 1916. This is a family owned farm. 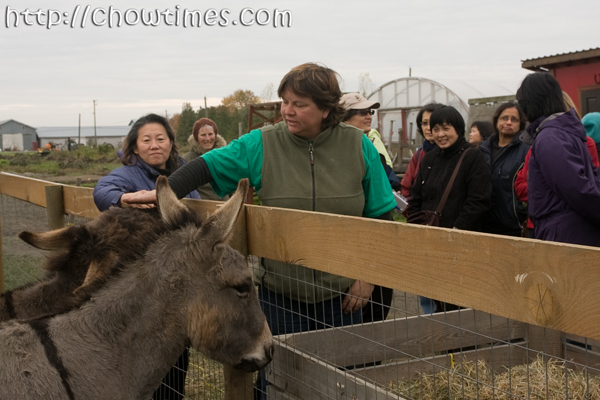 The farm is easily access from the main road and clients from Vancouver and Burnaby do come to the farm for vegetables. Sharon is the third generation owner of the farm. She is our tour guide for this field trip. Our first stop is the barn. 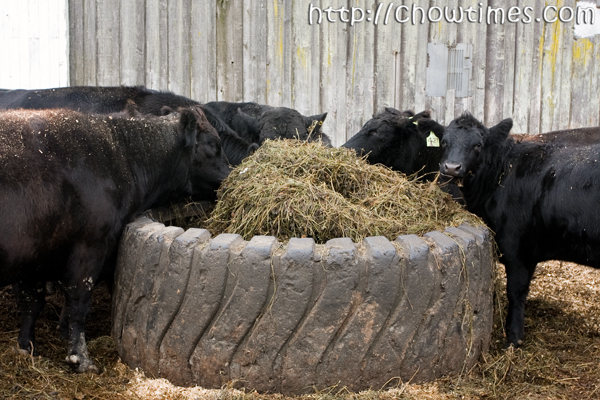 Sharon told us that the farm started with some dairy cows but had switched to beef cattle now. Sharon’s dad is more on the commercialization of the farm while Sharon concentrate more on promoting the farm through farm tour. Majority of the tours are from school groups. 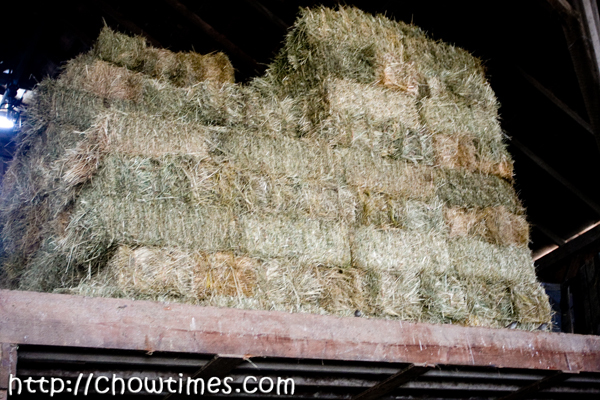 The farm also produces hays for their own cattle consumption. After the barn tour, Sharon brought us to their Janet’s Henhouse. The Henhouse has about eight to ten or so hen and a rooster. 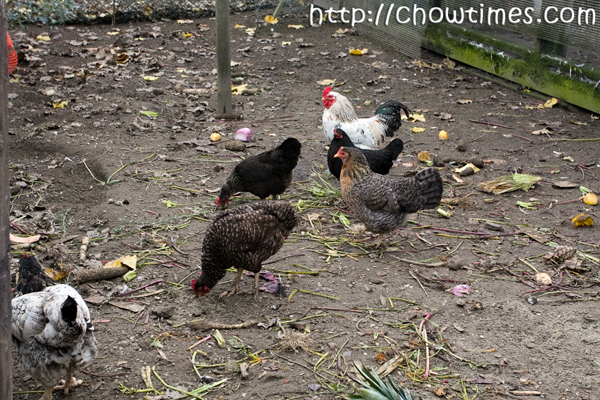 Sharon feeds them with all sorts of produce from the farm. The eggs for mainly for own consumption. After the tour to all the animals, Sharon brought us to a huge barn. We were astonished by the mountain of potatoes in the barn when the door was opened. These potatoes are called white potatoes. They are primarily supply to restaurants only. You can’t find these potatoes in the grocery stores. 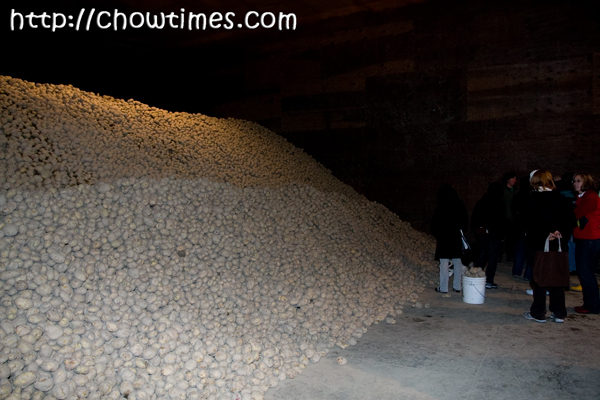 The reason is these potatoes are susceptible to light and have to be stored in a dark, cool and airy place. Once these potatoes are exposed to light, they will turn green and become toxic. These potatoes are great for mash potatoes. We were brought to the farm as the last item of the tour. Unfortunately, at this time of the year, there is nothing much in the farm for us to see. Sharon showed us the area of the farm which is planted with strawberries, blueberries, potatoes, peas, garlic, etc in spring and summer. The farm employs integrated pest management which uses minimum spraying and the spraying is mainly on the rim of the farm. Early detection is the best way to deal with pest. Sharon explained to us that the soil in this area is very heavy and it’s only good for root vegetables. 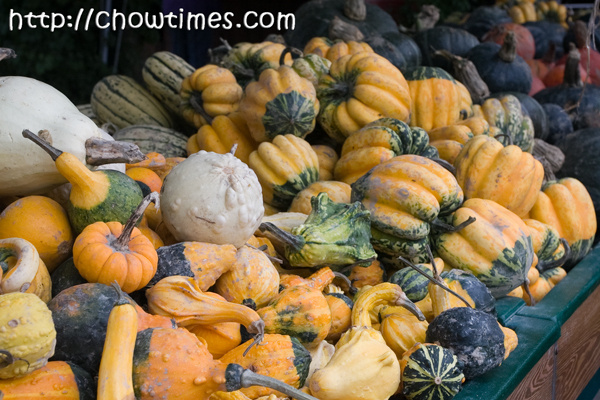 There are plenty are pumpkins, squashes and gourds in the market of the farm for sale. 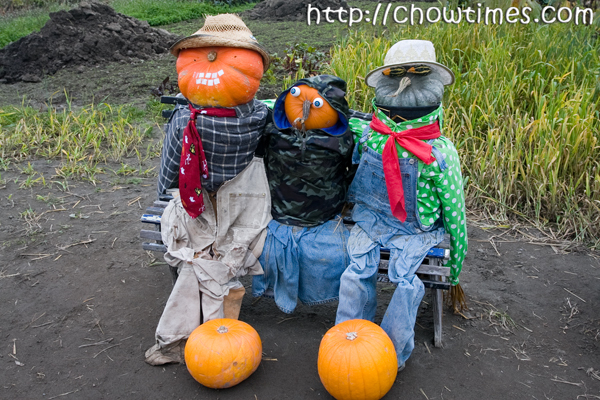 The farm also has a pumpkin patch for school tours. I particularly like this decor for Halloween. It’s very creative and family oriented. 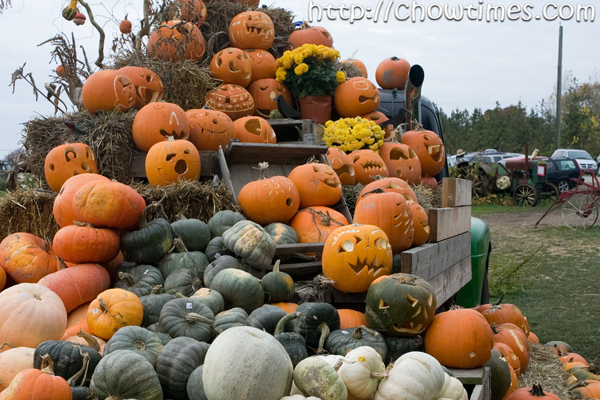 There are lots of pumpkin carved for the Halloween all around the market area of the farm. Click on Read More to see more photos from the farm. 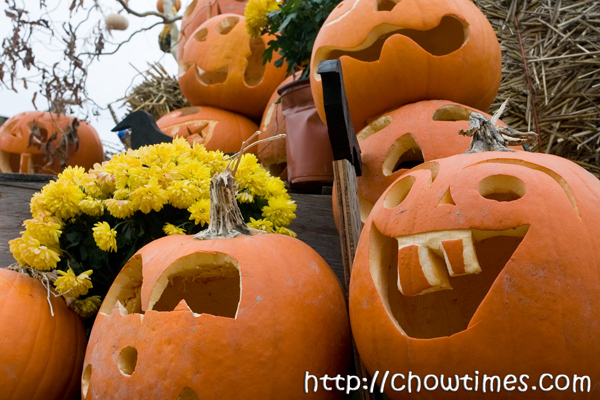 Ben and I would like to wish all chowtimes reader a happy Halloween and have a safe trick-or-treating night. Heidi made a Tapioca Pearl (Sago) Tart for dessert. 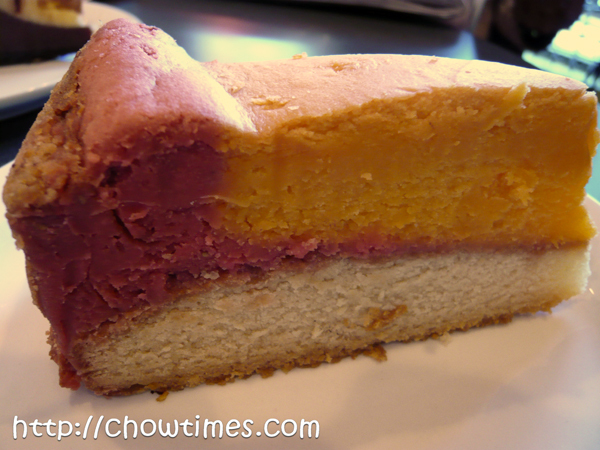 The Tapioca Pearl Tart is best eaten cold as the tapioca will be more chewy when chilled. 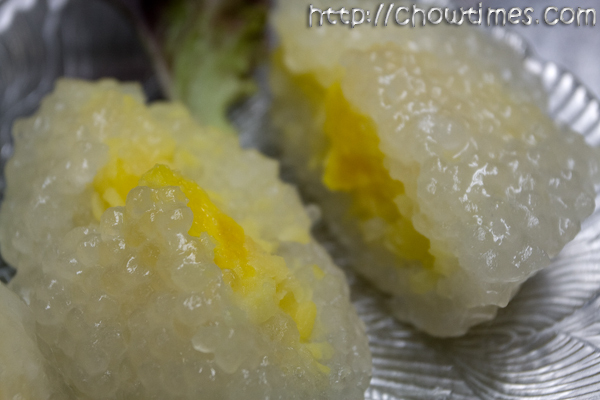 The translucent tapioca looks like little pearls, very delicate and soft but it has a chewy texture unlike it’s look. 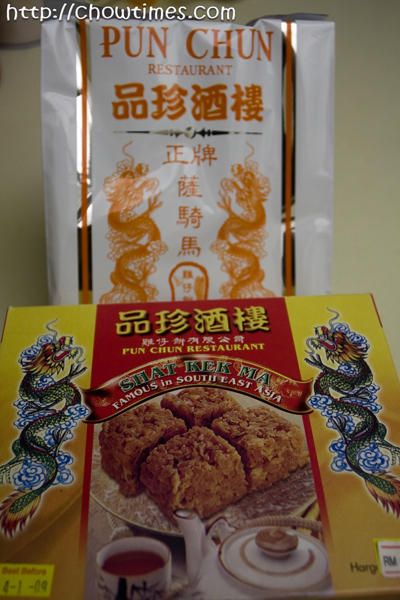 The salted egg yolk and sweet yellow mung bean paste filing complements one another well. Heidi shared two recipes in the Gilmore Park Church Community Kitchen. Heidi made a salad and a dessert. It is always a pleasure to have Heidi demonstrates in the kitchen as her recipes are always very original. The Pork Cheek came out very tasty and tender. Heidi used Mirin, a Japanese sweet cooking seasoning to marinate the pork cheek which gives the sweetness to the pork. The Thai flavour dressing gives a kick to the salad. The sour and spicy dressing certainly brings up ones appetite. Heidi emphasized on using a good quality fish sauce for the dressing as it makes a big difference in taste. Cheap fish sauce usually has too much salt in it and does not taste good. 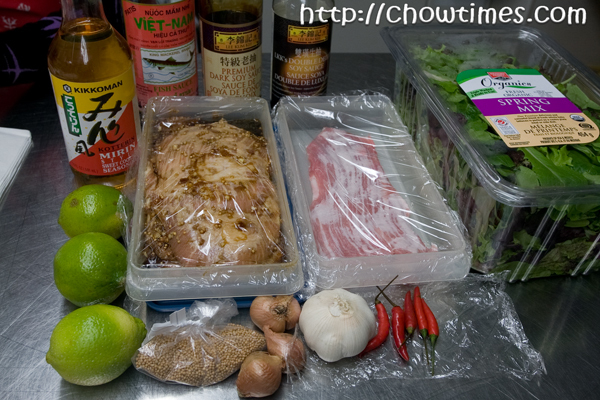 Fish sauce is usually used in small amount and a good quality bottle just cost from $7 to $10. A bottle goes a long way. A dear friend brought this back from Malaysia for my family. It’s a popular snack food in Malaysia. The snack is called Shat Kek Ma. 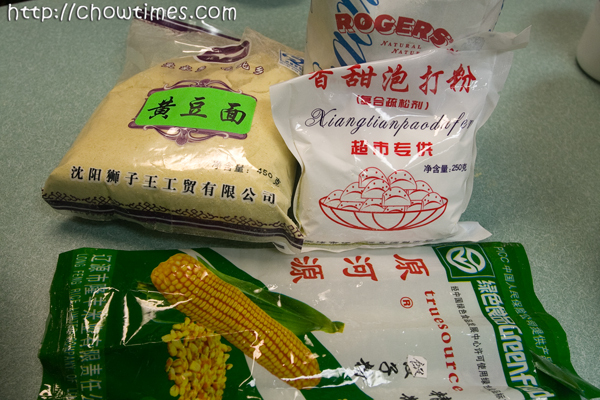 To me, goodies from Malaysia which I cant find in Vancouver are precious commodities. I am so thankful to friends who made their trip to Malaysia and come back with such priceless gifts. 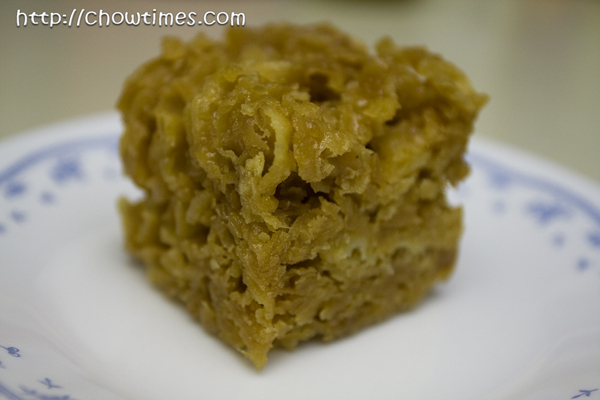 Shat Kek Ma is a sweet snack made from flour, wheat molasses, sugar, cooking oil and eggs. You can find other brand of Shat Ket Ma in Chinese groceries like T&T but they are not as good as this particular brand from Malaysia. The soup which the seniors made in the South Arm Community Kitchen is called Cranberry Sweet Potato Soup. Soup is just great for the colder fall weather. 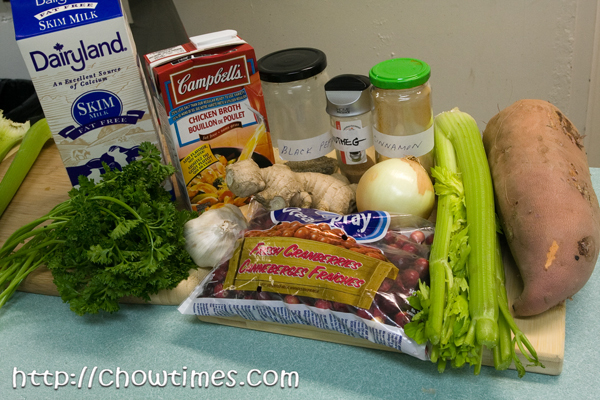 Moreover, most soup can be frozen in small batches for up to 2 months. Reheat the soup on the stove gently and you can have a bowl of hearty soup anytime. October is the harvest time for cranberries and Richmond is the top producer of cranberries in BC. Cranberry is a superior source of nutrition and vitamins. It is an excellent source of antioxidants which helps to protect against cancer, heart disease and bladder infections. Cranberry juice is also rich in polyphenol content as in red wine which makes it a heart-healthy drink. This Cranberry Sweet Potato Soup is a sweet soup with a hint of tanginess from the cranberries. It has a very strong flavour of cinnamon. 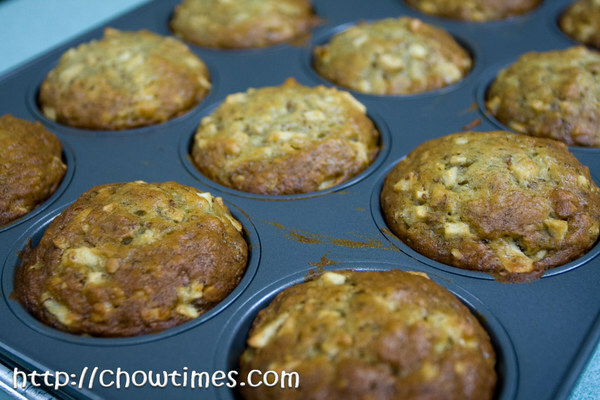 While one team is working on the soup recipe, another team worked on the dessert which is Apple Banana Muffin. I had blogged on the muffin recipe here. 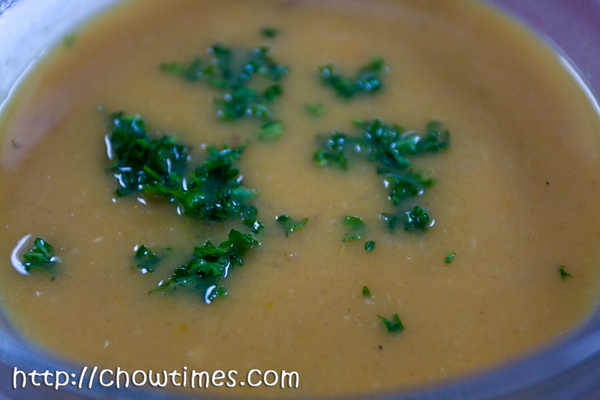 Click on Read More for the instructions to make the Cranberry Sweet Potato Soup. The South Arm Community Kitchen for Seniors met again for another cooking session. This week, the seniors made three dishes, a chicken dish, a soup and a dessert. I love to watch the seniors at work. They are always working in teams and they worked in harmony. 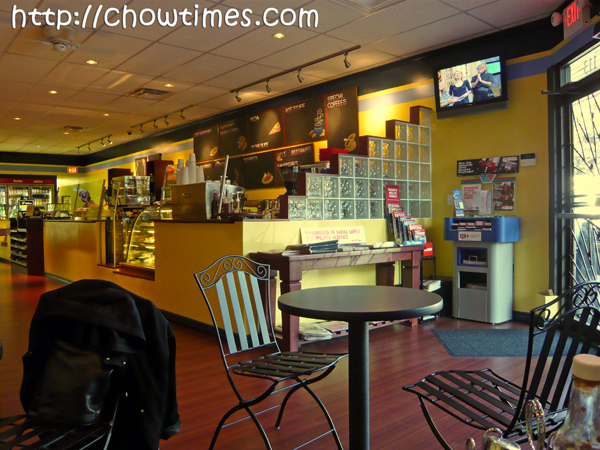 It is a great place where they get great company and make delicious food. They always have food to take home too. Some of the seniors are living by themselves and it’s very hard to cook for one or two people only. 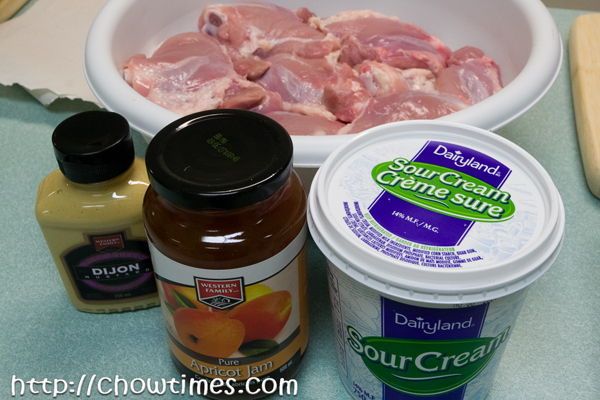 The first dish is called Southern Apricot Chicken. This is such a simple dish that even a kid can make it. 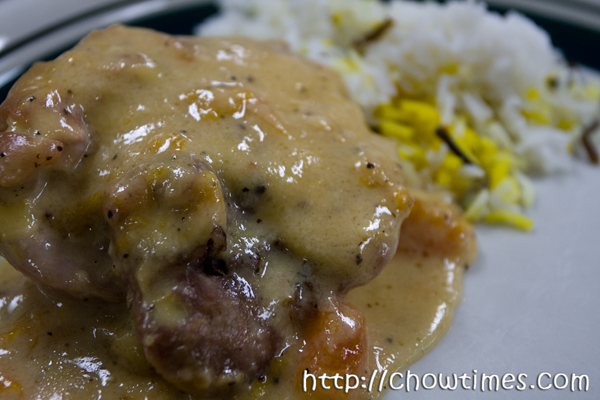 A great sweet and saucy chicken dish which is great with steam rice or noodle. 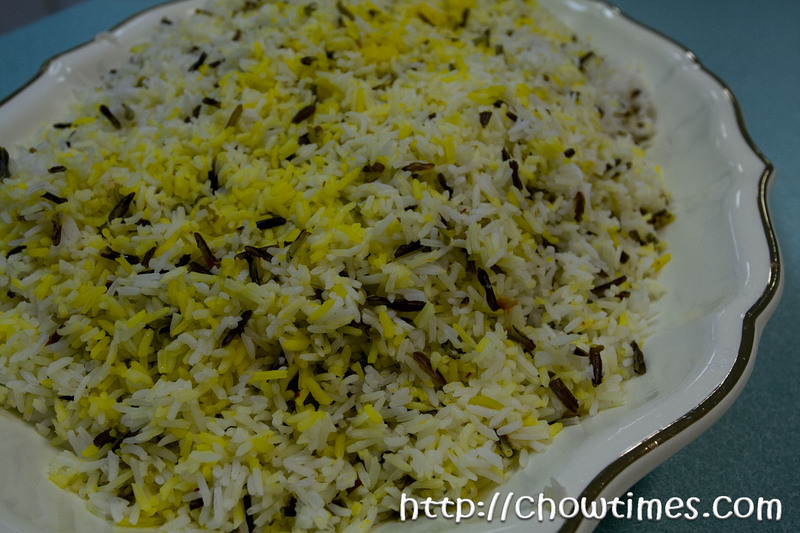 Minoo made a big platter of safflon flavoured basmati rice with wild rice to go with the Southern Apricot Chicken. Updated: 19th July 2011: This restaurant is closed according to Urbanspoon.com. Updated: 6th Jan 2011: This restaurant is now called Bailey’s Bistro & Specialty Stores according to Urbanspoon. Polly and I met up again for our ladies’ get together. We have change our cake meet day from Tuesday to Friday. 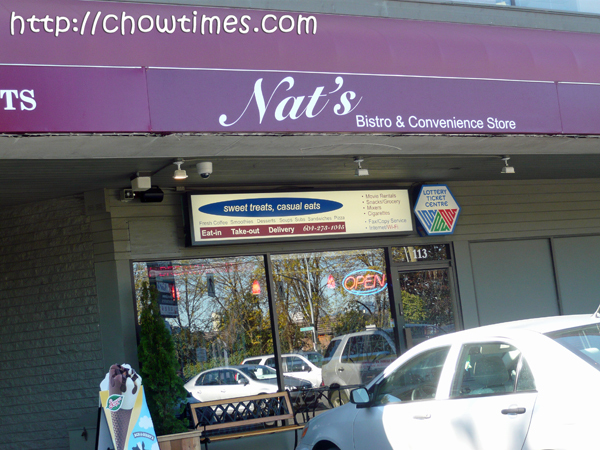 This time we went to Nat’s Bistro & Convenience Store. Nat’s Bistro & Convenience Store has opened only for about 3 months. I got to know of this place through an advertisement in the local papers they put up sometime in August when they newly opened. But, I did not get a chance to visit it until now. 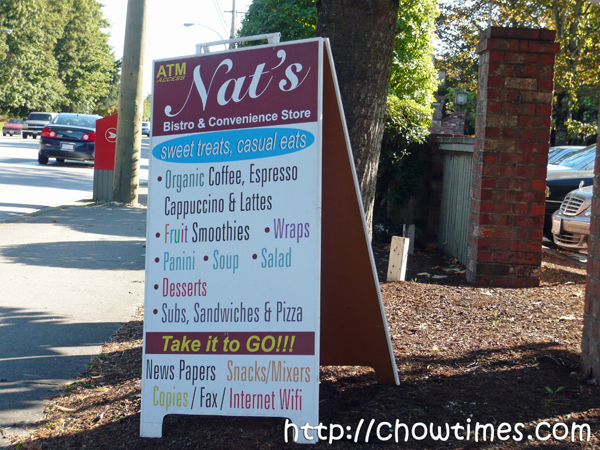 Nat’s Bistro & Convenience Store is located at a small strip mall on Westminster Hwy between No. 1 & 2 Road. It is perhaps a new concept where they combine a bistro and convenience store in location. The place is very clean and new. It has a siting capacity of 10 people. What I noticed is that there are 5 high definition televisions in the store. It might be a good place to go watch a hockey game with friends on game night. But the metal chairs are really not comfortable though, cold and hard. 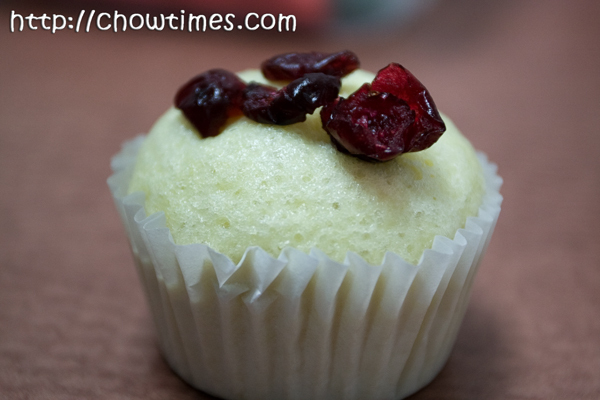 The next dessert which Ming made is Ma Lai Ko Cup Cakes. I had blogged about two versions of Ma Lai Ko here and here but Ming’s recipe is slightly different. Ming’s version of Ma Lai Ko is steamed in paper cup and it only takes 10 minutes to steam. This recipe is very handy when you have unexpected guests. 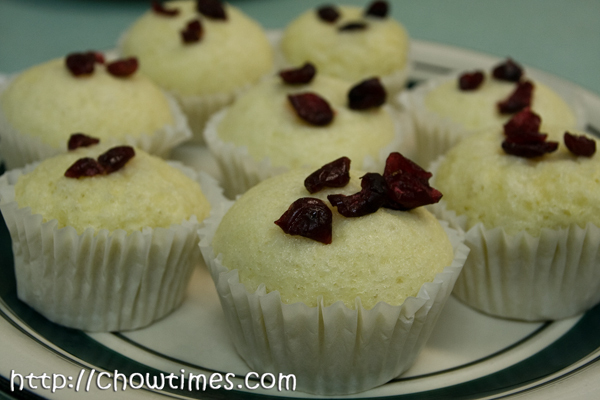 Ming made 2 versions of Ma Lai Ko Cup Cakes, one regular flavour and another with grated Parmesan cheese. The one with the Parmesan cheese has a stronger flavour and I’ll bet Arkensen will like this version as he is a cheese lover. Ming made two desserts in the South Arm Community Kitchen after Andrea finished with her German dishes. 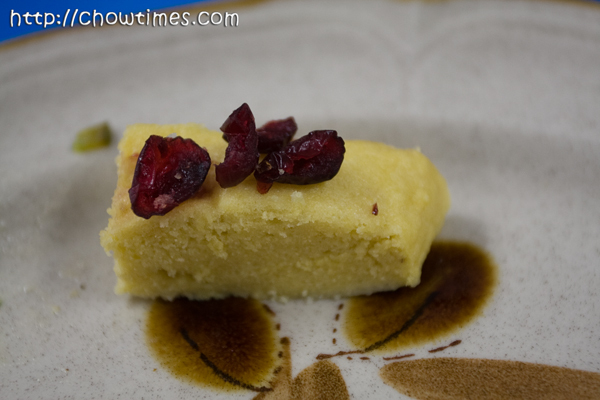 The first dessert is Little Bowl Cake or Seow Wor Tou in Mandarin. The Little Bowl Cake is not supposed to look like this. 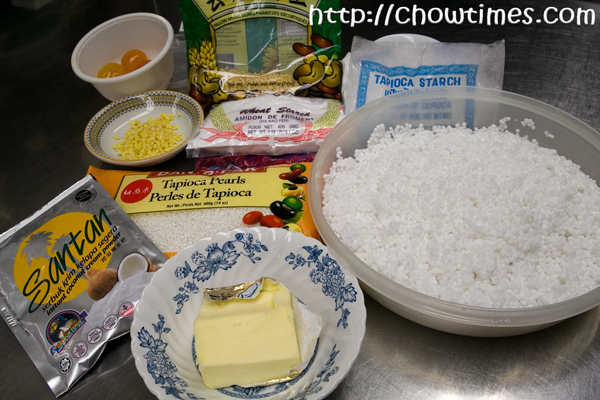 But when Ming made this cake, she might have added too much water and she does not have enough corn flour to adjust the consistency of the dough. The dough was too soft to mold into a little bowl. I will illustrate how it should be made in the instruction section. Andrea made a Spelt Salad to complement her Kidney Bean Casserole. It is another German dish. 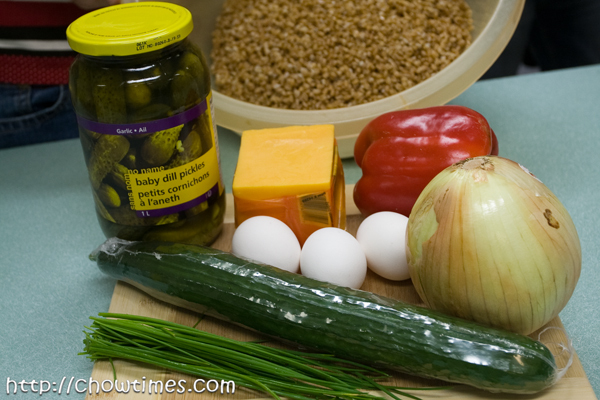 Andrea brought this Spelt Salad to the community kitchen potluck before. Spelt is in the family of wheat. It has a moderate amount of gluten, thus suitable for baking. Spelt which is made into bread, biscuits, crackers and pasta can be found in health food stores. The Spelt Salad can be a meal by itself. It has lots of vegetables, grains and eggs in it. 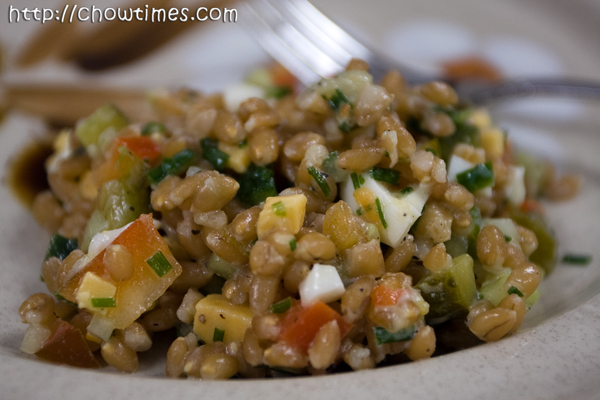 Someone commented that this salad makes your jaw works out quite a bit as the spelt is quite crunchy and chewy.